This tract is truly an off grid mountain property. 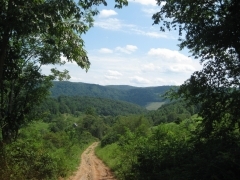 Located in cravenstown TN it sits on a hill with a small driveway and many homesites to choose from. The property has a creek on the back part of the property and is spring fed. Nice views of neighboring hills. This property is unique due to the fact it's on a private road and is located in a village with about 150 people. This property can be purchased with our traditional financing.